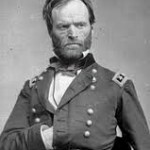 Attack: Union General William Tecumseh Sherman is now commander of the Union Armies in the Western Theater, as Grant has been named Commander of all Federal Armies and moved his command north to Virginia. Up north is the Civil War Eastern Theater where Union General George Meade commands the Army of the Potomac battling Lee. General Grant will advise Meade to “go where Lee goes”. Grant will decide to stay with Meade up north and continue to fight and wear down Lee in Virginia. His trust in Sherman down south is complete. Grant advises Lincoln that Sherman has the skill and tenacity to defeat the Confederate army down in the Western Theater of Georgia and Tennessee. Lincoln is confident of Grants advice that “Uncle Billy” Sherman can defeat the Rebel army in the Battle of Atlanta. Lincoln is also pleased that Grant has stayed north to directly oversee the campaign against Lee in Virginia with Union General Meade. 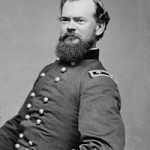 Sherman has engaged CSA General Joseph E. Johnston in continuing his fight in the Atlanta Campaign at places such as Battle of Resaca and the Battle of Kennesaw Mountain. These were flanking maneuvers by Sherman whereas Johnston would withdraw before envelopment. 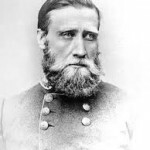 The CSA command feels Johnston is holding back the fight and replaces him with CSA Lt. General John Bell Hood on July 17th, 1864. McPherson will have the distinction of being the only Union Army Commander ( “Army of the Tennessee”) and the second highest in rank to be killed ( after John Sedgwick at Spotsvania, Va. ) in the field. The CSA attack is stalled and Hood is finally pushed back by the Union XV Corp under Union Major General John A. Logan in a desperate counter attack. The Union lines are restored and Sherman continues his siege of the city. Hood will burn over 80 railroad cars of supplies and ammunition as he abandons Atlanta, Georgia on September 1. The fire and explosions will be remembered as a sad and ghastly end for the Confederacy in Georgia, as they retreat from the firestorm that was the Battle of Atlanta. Atlanta, Georgia is surrendered on September 2, 1864 to Union forces by the Mayor and town committee.